Valley Forge Signal Seekers (VFSS) club members primarily meet at two different locations during the year. One is our flying field and the other is a church building where we hold our monthly club meetings. Some of our Monthly meetings are held at our flying field during the warmer season and may include flying, food, and demonstrations. Be sure to checkout our club calendar of events to see where and when we are meeting! Click on the picture for directions via Google Maps! 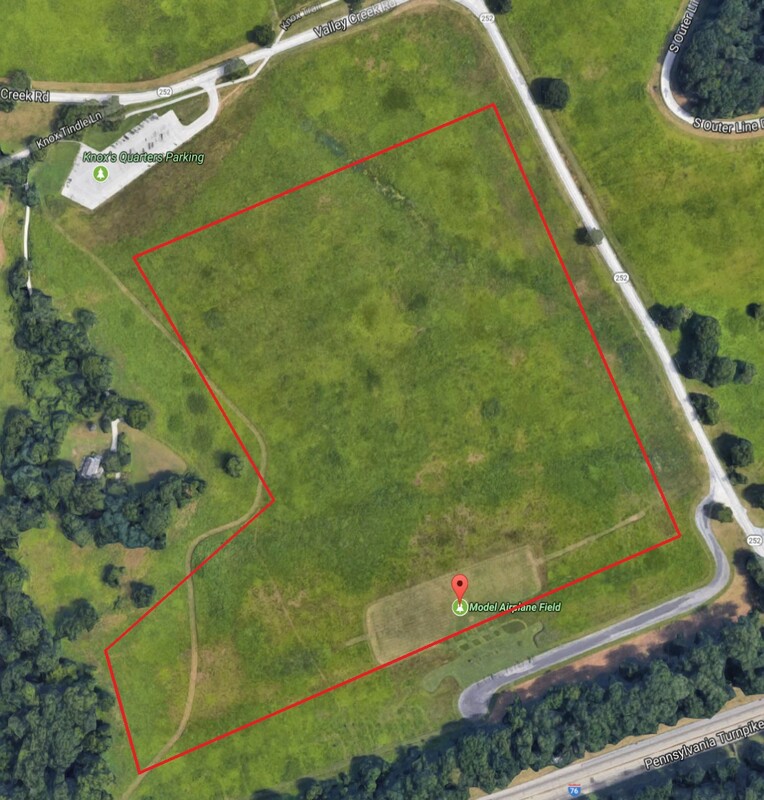 Our flying field is located inside Valley Forge park on North Valley Forge Road just as you enter the park. The field is open to the public who often come out to watch RC planes flying during the week and on weekends. The Valley Forge Signal Seekers flying field boasts a smooth grass runway (approximately 450 ft long by 125 ft wide) with a flight-line that provides a beautiful view into the park. Our field is maintained by the VFSS RC Club and its members. No taxpayer dollars are used to maintain the site. Fixed-wing airplanes are flown off the main runway and Helicopter and Multi-rotor may be flown off the runway depending on air traffic, or flown from the dedicated helicopter pad to the left of our field information sign. Powered Aircraft Operation (Except Electric Power)is prohibited prior to 1:00 PM on Sundays and prior to 9:00 AM all other days. Note: Our flying boundaries are denoted by the red line. Note: During the summer flying season we often hold monthly club meetings at the flying field. Be sure to check our event calendar to see which location we are meeting. Click on the button above to see upcoming events.